Our team of cheese makers make a delicious range of award-winning cheeses from organic and conventional cow, goat and sheep milk which you can buy directly from the dairy or through our online ordering service. All our cheeses are made using pasteurised milk and are suitable for vegetarians. 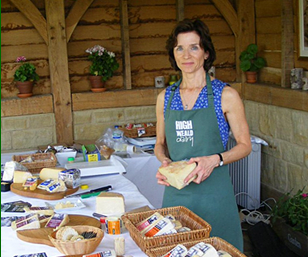 Cheeses are available in a range of sizes from 150g wedges to whole wheels (or truckles). Cheese gifts and orders bought online are packed with ice packs and we use Parcel Force for overnight delivery, when ordering, please state a safe place to leave your order should you not be at home on the delivery day. The packing and delivery cost for cheeses bought online is Postage £9.95 per order, with Free Postage for all orders over £55.00.